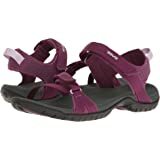 So I wanted something a bit more stylish and bit lower profile and the Teva Verra made my list. Backstory- I have been wearing one pair of Chacos ZX/2 for years until finally a strap started to fray. They fit perfectly and are super comfortable. 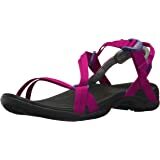 Sleek yet comfortable, the Teva® Verra sandal is ready for adventure wherever you go! Webbing upper. Hook-and-loop closure for easy adjustability. Nylon shank for lightweight stability. Contoured EVA foam midsole provides excellent support. 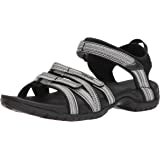 Cushioned footbed with Microban® zinc-based antimicrobial treatment to fight odor-causing bacteria. Shoc Pad™ in the heel for added comfort and shock absorption. Spider Original rubber outsole is designed to provide excellent grip on both wet and dry surfaces. Imported. Measurements: Weight: 7 oz Product measurements were taken using size 9, width B - Medium. Please note that measurements may vary by size. Weight of footwear is based on a single item, not a pair. 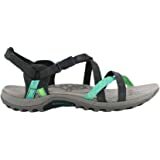 5.0 out of 5 starsLove these hiking sandals! I know you're thinking they're white and they'll get so dirty but they clean easily with just water, I live in Florida and I'm out in my yard working with these on and they'll get filthy but unjust run the hose over them and they're clean again! They're super comfy, Teva usually is. Can't go wrong with this buy. 5.0 out of 5 starsGreat sandal!! They do run a wee bit long, though. My sister has a pair in a size 8, which is the size I normally wear. After trying them on, I felt that they were a hair too long, and going down a half size would better suit my foot in terms of length. So, I ordered a 7.5. While the length of the sandal was correct, the rest of it was a poor fit. The sides were a bit narrow (I've got wider feet to begin with), and the top strap was so snug I had a hard time getting the Velcro to secure itself. It was just too tight for my lady hobbit feetses. That being said, the strap over the toes fit just fine. I ended up returning them and ordering the size I normally wear, and should have ordered, the 8. The length, as I've said, is a little long for my liking, but the rest of the sandal fits so well that I'm more than willing to overlook it. 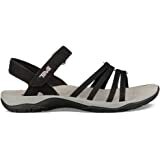 The straps fit perfectly over the top of the foot, and the footbed is nicely cushioned, providing a perfect amount of support without feeling like my feet sink with each step (I hate that). I highly recommend these, just remember that they may run a tad long. If you've got longer feet, you'll be set. If you don't like them that way, I'd suggest a different sandal. Update: I love these! I can wear them all day, multiple days in a row, and they are still ridiculously comfortable! No blisters, no tender spots. The straps stretched a tad, but I needed them to. They fit like a glove. 5.0 out of 5 starsTevas ARE cool! 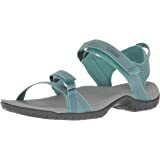 Back in the early 2000's, my parents always wore the clunky, bright-colored, water shoe Teva sandals. 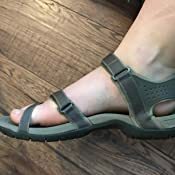 I used to make fun of them because they were so hideous so it's been an ongoing joke in our family that I would never wear them....I just assumed all Tevas were fugly because of the ones my parents wore. The joke was on me when I told them I ordered a pair of Tevas for an upcoming medical mission trip to Guatemala! 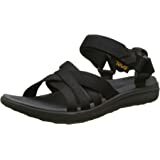 I wanted a pair of not-flip-flop sandals that I could walk around comfortably in for long periods of time, didn't take up alot of space in my pack (I only brought two pairs of shoes for the whole week, Merrell sneakers for working & hiking and these for everything else), could be worn in the water if needed...AND that aren't a complete eye sore. 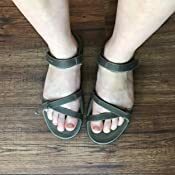 These were probably the most attractive, versatile sandals that met all of the things I was looking for. They are VERY comfortable and look good with pretty much everything! The strappy style makes it easy to dress up with a sundress, and the bungee cord color in particular looks great with jeans (I'm in my twenties if that matters at all). A bunch of other girls on the trip complimented and asked where I got them. These shoes were well worth the $50 and will continue to be throughout my summer travels and camping trips in California. 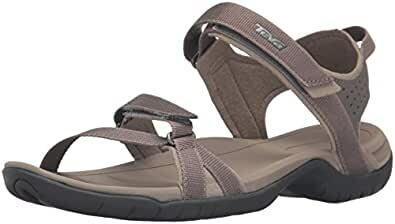 Now I see all the hype about Teva that my parents tried convincing me of for years! Yay Teva! I normally wear a size 9 in tennis shoes but I could go down a half size depending on the shoe. I've read that these can run a bit long so I ordered a 8.5. It's a perfect fit, not a lot of extra room yet my toes aren't close to the edge to be stubbed. I should also mention I have short toes. Good support. I don't have high arches, I can feel the arch support as I stand and walk. My feet are a little on the wide side, I have gotten wide sizes in the past but not often. The straps fit great, I don't have wide ankles, they don't rub or dig in on me. I've worn them for a full 2 days running errands around the city. I am going to Africa in 2 weeks and there will be lots of walking on dirt and rock paths. This review may change. These were the only pair of shoes that I took on a 3 week trip to Malaysia. 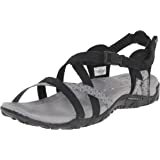 I spent a lot of time searching for the correct sandal since arch support is a definite must for me and I didn't want a huge, clunky sandal. 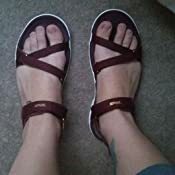 While in Malaysia I walked between 5 and 10 miles per day, but my feet were as comfortable as they would have been if I was wearing sneakers and the style of the sandal with my casual clothing was fashionable enough for a young adult. Over time, the sandal will conform to fit your foot which makes it more comfortable. They are also very lightweight so they're not an extra weight on the body when walking long distances and they dry quickly once wet. I normally wear a size 8 but decided to follow the reviews and size downward to a 7.5 and they were a perfect fit. I got them in white and the only con about that was the sole of the sandal will catch dirt and grime from the foot and leave dark marks. This is solved by cleaning them with soap, water and a toothbrush, or just wet wipes in the crevices. Great buy! I would get them again. 5.0 out of 5 starsWonderful shoes! These shoes are soooo comfortable. Wore them for the first time all day at a waterpark. They felt good on my feet all day....no blisters! Super cushiony and comfortable!